The Treaty of Lodi, also known as the Peace of Lodi was a peace agreement between Milan, Naples, and Florence signed on 9 April 1454 at Lodi in Lombardy, on the banks of the Adda. It put an end to the long struggles between expansive Milan, under Filippo Maria Visconti, and Venice in the terraferma, which had produced a single decisive Venetian victory, at the battle of Maclodio in 1427, in which the Venetian ally was Florence, but had resulted in no lasting peace: see Wars in Lombardy. After a further generation of intermittent seasonal campaigning, the Treaty of Lodi established permanent boundaries between Milanese and Venetian territories in Northern Italy, along the river Adda. Francesco Sforza was confirmed as the rightful duke of Milan. 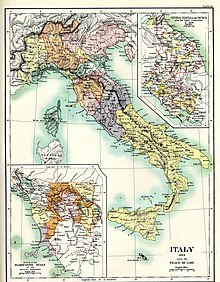 A principle of a balance of power in Northern Italy was established, one that excluded ambitions of smaller states: the republic of Genoa, the house of Savoy, the Gonzaga and the Este. A related agreement was signed at Venice on 30 August, among Milan, Venice and Florence, which had switched sides, in which the parties bound themselves to principles of non-aggression. The Kingdom of Naples and the smaller cities, even the Papal States, soon joined the Italic League. Thus, the Peace of Lodi brought Milan and Naples into a definitive peace alliance with Florence. Francesco Sforza would base his lifelong external policy on this principle of balance of power. The status quo established at Lodi lasted until 1494, when French troops intruded into Italian affairs under Charles VIII, initiating the Italian Wars. The Treaty was abrogated in 1483 when Venice and the Pope fought a war against Milan. While lasting less than 50 years, some scholars have argued that the Treaty provided a proto-Westphalian model of an inter-city-state system (as opposed to an inter-nation-state system) following a century of incessant warfare in Northern Italy. The Treaty functioned to temporarily institutionalize a regional balance of power in which outright warfare gave way to diplomacy. ^ and brought peace, though not to Venice. Some of the crosses incised in prominent rock outcroppings may still be seen. ^ which was to recall the league against the power of Rome headed by the Samnites in the first century BC. Francesco I Sforza was an Italian condottiero, the founder of the Sforza dynasty in Milan, Italy, and was the fourth Duke of Milan from 1450 until his death. He was the brother of Alessandro, whom he often fought alongside. Francesco Foscari was the 65th Doge of the Republic of Venice from 1423 to 1457. His reign, the longest of all Doges in Venetian history, lasted 34 years, 6 months and 8 days, and coincided with the inception of the Italian Renaissance. Ludovico III Gonzaga of Mantua, also spelled Lodovico was the ruler of the Italian city of Mantua from 1444 to his death in 1478. The following is a list of rulers of Milan from the 13th century to 1814, after which it was incorporated into the Kingdom of Lombardy–Venetia by the Congress of Vienna. The Italian Wars, often referred to as the Great Wars of Italy and sometimes as the Habsburg–Valois Wars, were a series of Renaissance conflicts from 1494 to 1559 that involved most of the Italian states as well as France, the Holy Roman Empire, Spain, England and the Ottoman Empire. The Duchy of Milan was a state of the Holy Roman Empire in northern Italy. It was created in 1395, when it included twenty-six towns and the wide rural area of the middle Padan Plain east of the hills of Montferrat. During much of its existence, it was wedged between Savoy to the west, Venice to the east, the Swiss Confederacy to the north, and separated from the Mediterranean by Genoa to the south. The Duchy eventually fell to Habsburg Austria with the Treaty of Baden (1714), concluding the War of the Spanish Succession. The Duchy remained an Austrian possession until 1796, when a French army under Napoleon Bonaparte conquered it, and it ceased to exist a year later as a result of the Treaty of Campo Formio, when Austria ceded it to the new Cisalpine Republic. The War of the League of Cambrai, sometimes known as the War of the Holy League and by several other names, was a major conflict in the Italian Wars. The main participants of the war, fought from 1508 to 1516, were France, the Papal States and the Republic of Venice; they were joined, at various times, by nearly every significant power in Western Europe, including Spain, the Holy Roman Empire, England, the Duchy of Milan, Florence, the Duchy of Ferrara and Swiss mercenaries. Niccolò Piccinino was an Italian condottiero. The War of the League of Cognac (1526–30) was fought between the Habsburg dominions of Charles V—primarily the Holy Roman Empire and Habsburg Spain—and the League of Cognac, an alliance including the Kingdom of France, Pope Clement VII, the Republic of Venice, the Kingdom of England, the Duchy of Milan and the Republic of Florence. The Golden Ambrosian Republic was a short-lived government founded in Milan by members of the University of Pavia with popular support. With the aid of Francesco Sforza they held out against the forces of the Republic of Venice, but after a betrayal Sforza defected and captured Milan to become Duke himself, abolishing the Republic. The Battle of Bicocca or La Bicocca was fought on 27 April 1522, during the Italian War of 1521–26. A combined French and Venetian force under Odet of Foix, Viscount of Lautrec, was decisively defeated by an Imperial–Spanish and Papal army under the overall command of Prospero Colonna. Lautrec then withdrew from Lombardy, leaving the Duchy of Milan in Imperial hands. Cassano d'Adda is a town and comune in the Metropolitan City of Milan, Lombardy, Italy, located on the right side of the Adda River. It is on the border of the Metropolitan City of Milan and the province of Bergamo. It is served by Cassano d'Adda railway station. Bianca Maria Visconti was Duchess of Milan from 1450 to 1468. The Republic of Venice, traditionally known as the Most Serene Republic of Venice, was a sovereign state and maritime republic in northeastern Italy, which existed for a millennium between the 8th century and the 18th century. It was based in the lagoon communities of the historically prosperous city of Venice, and was a leading European economic and trading power during the Middle Ages and the Renaissance. The Italic League or Most Holy League was an international agreement concluded in Venice on 30 August 1454, between the Papal States, the Republic of Venice, the Duchy of Milan, the Republic of Florence and the Kingdom of Naples, following the Treaty of Lodi a few months previously.